Resistance is measured in units called ohms. Wire wound resistors normally have their values in ohms and tolerance in percent stamped on them. For carbon or composition resistors a color code is used. The resistance values, for several years, have been coded by three colored bands painted around the body of the resistors. If the tolerance is either 5 or 10 percent, a fourth color bond is added. The position of the bands is shown below. The first two colors tell the first two digits in the resistance value. The third band tells how many zeros follow the first two digits. Sometimes a fourth band is present. This band tells the tolerance and will be either gold or silver. A gold band means 5% tolerance, silver 10%, and no fourth band, 20%. The tolerance band tells how close the resistance should be to the value shown by the other three bands. The Producer of Reading the band is given below. 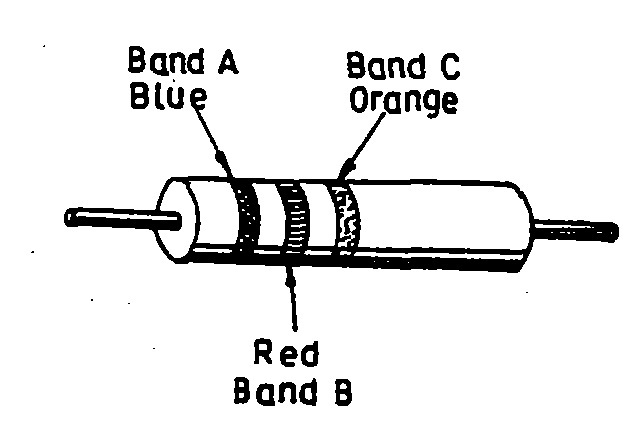 The Blue-Red-Orange bands signify 62 followed by three zero and would be read as 62000 ohms +-20%. 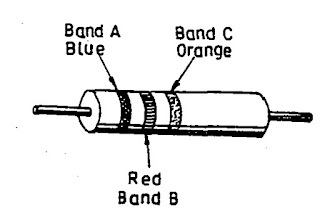 We hope that this post "How to Read Resistor Color Code" will help you in your preparation. if you have any suggestion and request, you can tell us through the comment here.